Once again, a Hollywood movie is leading ahead of adjacent Bollywood offerings at the Indian box office. 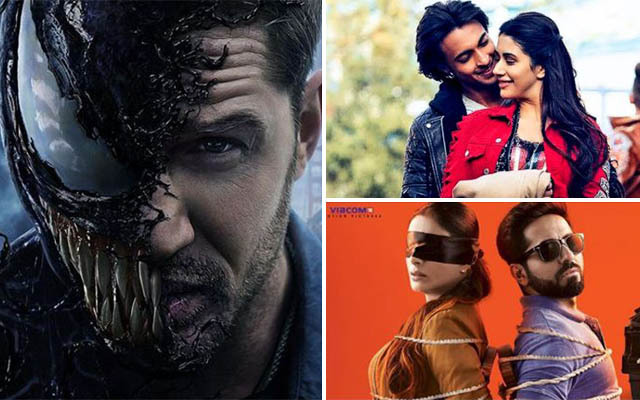 Yes, we are talking about the newly released American superhero movie Venom, which is getting a better response than the Hindi ones Andhadhun & LoveYatri from the Indian audience. 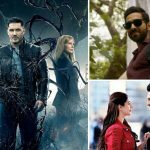 Starring Tom Hardy, Venom has got succeed to entertain the viewers and received mostly positive reviews from the critics as well as the audience. On Friday, it opened on a good note and registered the business of 4.09 crores. Then on Saturday, with a fair jump, it collected 5.32 crores and raised 2 days total to 9.41 crores nett (12.06 crores gross). On the other hand, the first Hindi release Sriram Raghavan’s directorial suspense thriller Andhadhun has received quite positive reactions from everyone but still managed to register an average opening. On the first, it recorded an occupancy of only 15-20% and minted the amount of 2.70 crores. On the next day i.e. Saturday, Ayushmann Khurrana, Tabu & Radhika Apte starrer showed remarkable growth as expected and done the business of 5.10 crores. After 2 days, the total collection of Andhadhun has become 7.80 crores at the domestic box office. 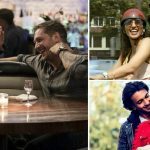 While Salman Khan’s production romantic musical-drama LoveYatri has also got succeed to hit the target right and gathered positive feedback. Even though, it remained overall average and collected the amount of 2 crores. On Saturday, with a considerable jump, newcomers Aayush Sharma & Warina Hussain starrer raked 2.10 crores and raised 2 days total to 4.10 crores.